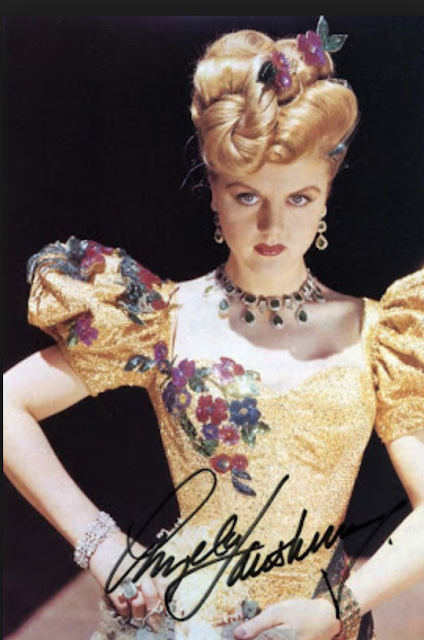 I'm writing an essay about how the brilliant Dame Angela Lansbury continues to stay relevant. She's not just a childhood favorite. She's a legitimate role model for a million reasons I'm currently trying to put into words. I even keep a framed picture of her on my desk. It was a gift from my friend Jen about ten years ago. I've displayed it in every office since then. Is it a little weird? Sure. But I do enjoy watching people slowly figure out who it is, then try to get up the nerve to ask if she's my grandma. Anyway, while I draft, I want to make sure you know about the Angela of three key eras. This is your homework, my friends. To you, she may be the voice of Mrs. Potts in Disney's Beauty and the Beast or a witch in training from Bedknobs and Broomsticks. But her career spans decades. 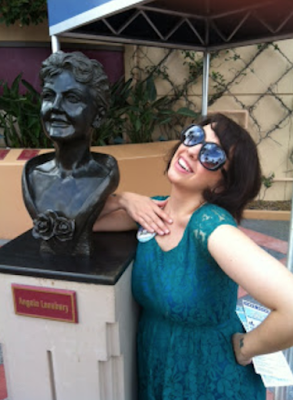 There's another Angela most of you don't know. The one who got an early start in the studio system by taking on the "bad girl" archetype...and taking it on quite well. Angie once tread the boards for fifteen years straight and has since returned for many runs. She's a triple threat. She originated iconic roles and spent plenty of time in classic shows. (Mame, Blithe Spirit, and Gypsy just to name a few.) By her own account, she kept ticket sales rolling along and made sure she got ten percent of the take, to boot. She also worked with her best friend, Bea Arthur, many times. How much do you wish you could go back in time and have a lunch date with these two? 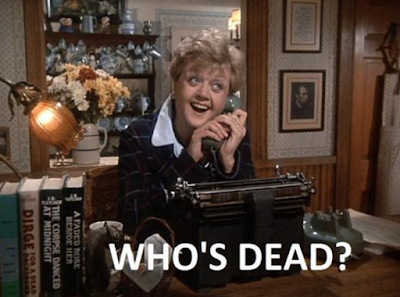 My favorite role of hers is still that of Jessica Fletcher in Murder, She Wrote. There's something innately empowering about the character. She enjoyed her time as a mother and a wife, she's clear about that repeatedly in show dialogue. We meet her in the pilot as a widow, but she's still a vital, involved member of her community. She then goes on to find world-wide success as a mystery writer, using the skills she's developed through research to solve real murders. She bakes bread when she needs to think. She travels extensively. She's always direct, but never rude. Not even to the actual murderers when she catches them. Plus, she even helped Magnum P.I. once. Speaking of which, no, I'm not watching the new Magnum. I know you didn't ask, but I have a lot of feelings. You get the sense from interviews that Angela Lansbury is a lot like Jessica Fletcher. She speaks confidently about making deals, demanding excellent pay and working conditions, and treating the crew well in this series of interviews from EmmyTV Legends.org. She understands her own agency. Bonus: She also did a workout video. See? Renaissance woman. I think I've made my point. I'm one of those writers who writes to discover. I don't really know what I'm trying to say until I gather all my research and take a few cracks at it. I'm just as curious as you are about what's brought Miss Lansbury to mind in such a strong way lately. I still love the internet for making this.